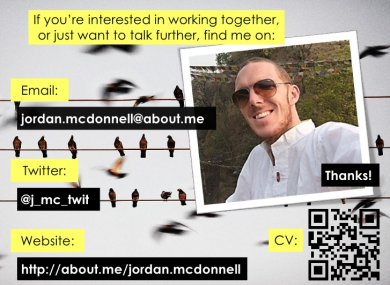 Commerce graduate Jordan McDonnell was being rebuffed for marketing jobs – so he put together a different kind of CV. A UCD GRADUATE has attracted interest from employers around the world after his alternative style of CV went viral and accrued over 90,000 views online in little over a week. Jordan McDonnell currently works as a financial analyst in the Netherlands – but with his contract nearly up, he wanted to change career, getting out of the world of accounting and getting a foothold in a more creative industry. Because of his lack of experience in such jobs, 26-year-old McDonnell had trouble attracting the attention of employers with a traditional type of CV – so he decided to take an alternative line of action. “What I’m doing now is very financial, very technical – not what I see myself doing for the long-term,” McDonnell told TheJournal.ie. Having grown bored in a previous accountancy job, McDonnell spent time travelling around India, and teaching in Nepal – returning to Ireland to complete a Masters in UCD, where he had already done an undergraduate degree in Commerce and Spanish. From there he secured his current job in the Hague – on a contract which will expire at the end of next month. McDonnell spent a week, after work, putting together a PowerPoint-style showcase summarising his life to date, and uploaded it to the slideshow-sharing website SlideShare, where it began to attract attention. Further coverage on Business Insider saw its views take off – now standing at over 92,000, nine days after it was first uploaded. And rather than needing to send his alternative CV to prospective employers, the employers have come to him – with response from companies of varying sizes from as far away as the United States and Australia, and three rounds of interviews completed already this week. McDonnell admitted he was “baffled” by how his presentation had taken off, and says contact has also come from other job-hunters expressing their admiration. I got a comment from a guy who coaches the long-term unemployed, who said it had been really inspirational. It shows that you can use creativity to create something beautiful, and make them sit up and take notice. McDonnell insists his unusual style of self-marketing does not require any specialised technological expertise or know-how. “The tool I used was basically just PowerPoint – I also looked at some websites you can download new fonts from, and the likes of Flickr and Creative Commons to download the images I’m looking for. He is also considering putting his experiences from his CV experiment to commercial use, creating guides on how to use similar outside-the-box techniques to produce “something very impactful”. Disclosure: McDonnell and the author of this article were occasional classmates for two years at undergraduate level. They did not graduate together. Email “UCD graduate’s alternative CV goes viral with 90,000 views”. Feedback on “UCD graduate’s alternative CV goes viral with 90,000 views”.